A new study found that a simple intervention could moderate otherwise polarized political attitudes, such as those toward a proposed Islamic community center and mosque near the World Trade Center site in New York City. The research, described in the journal Social Psychological and Personality Science, explored attitudes toward what some people refer to as the ground zero mosque, an Islamic community center and mosque built two blocks from the site of the former World Trade Center in New York City. When the Islamic center first was proposed it sparked a heated debate pitting proponents of religious freedom against those who felt the center should be moved away from the site of the 9/11 attacks out of reverence for those killed by Muslim extremists. 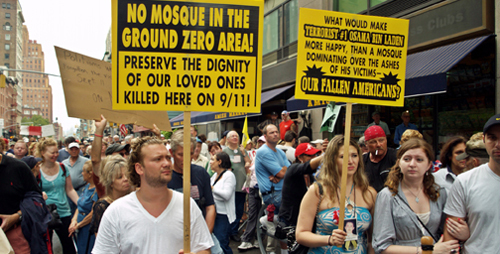 "We used the ground zero mosque as a particularly polarizing issue," said University of Illinois psychology professor Jesse Preston, who supervised the research with graduate students Daniel Yang and Ivan Hernandez. "People feel strongly about it generally one way or the other." Yang, now a postdoctoral researcher at Yale, designed the study with Preston and led the experiments. The researchers used techniques known to induce an abstract mindset in people, Preston said. Previous studies had shown that asking people to think broadly about a subject (with "why" rather than "how" questions, for example) makes it easier for them to look at an issue from different perspectives.
" 'Why' questions make people think more in terms of the big picture, more in terms of intentions and goals, whereas more concrete 'how' questions are focused on something very specific, something right in front of you, basically," Preston said. Previous research showed that abstract thinking enhances creativity and open-mindedness, but this is the first study to test its power to moderate political beliefs, Preston said. The interventions were simple. In the first experiment the researchers established that, after viewing an image of an airplane flying into one of the World Trade Center towers, liberals and conservatives held opposing attitudes toward the ground zero mosque and community center. A second study repeated the first with new participants and included one minor - but significant - change. Before they gave their views on the mosque and community center, participants answered either three consecutive "why" questions or three consecutive "how" questions on an unrelated topic - in this case, about maintaining their health. The "why" questions, but not the "how" questions, moved liberals and conservatives closer together on the issue of the Islamic center, Preston said. "We observed that liberals and conservatives became more moderate in their attitudes," she said. "After this very brief task that just put them in this abstract mindset, they were more willing to consider the point of view of the opposition." The researchers conducted a third experiment online to test the effects in a more diverse population. In this round, they asked participants to read an ambiguous "faux Yahoo! News" article that included multiple arguments for and against the Islamic center. Those who viewed the article in an easy-to-read format remained polarized in their views, the researchers found. But those who read the same article after it had been photocopied and made harder to read were more moderate in their responses. Making the information harder to read induced abstract thinking, Preston said. "It's a surprisingly powerful manipulation because people are thinking in a different way and putting in more mental effort while reading," she said. "We tend to think that liberals and conservatives are on opposite sides of the spectrum from each other and there's no way we can get them to compromise, but this suggests that we can find ways of compromising," Preston said. "It doesn't mean people are going to completely change their attitudes, because these are based on pervasive beliefs and world views. But it does mean that you can get people to come together on issues where it's really important or perhaps where compromise is necessary." This is one of two new studies from Preston's lab to explore interventions that moderate political bias. The other study, reported in the Journal of Experimental Social Psychology, tackles attitudes toward capital punishment and verdicts in a mock criminal trial.